When Helen ran off with Paris, her husband Menelaus, the king of Sparta, was very upset. He went to visit his older brother, Agamemnon (ag-a-MEM-non), the king of Mycenae. Menelaus reminded Agamemnon about the oath that all the suitors swore when they were fighting over who would marry Helen. Menelaus insisted that his brother call together all the Greek armies from all the different cities and go fight the Trojans to get Helen back. 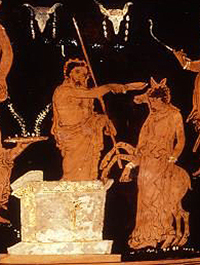 Agamemnon objected that he had only meant that he would defend Menelaus against the other suitors, but Menelaus still said he had to get Helen back or break his oath. So Agamemnon called all the Greek armies together at a port called Aulis (OW-liss). They got ready to sail to Troy. But when they were ready to sail, the wind was blowing always in the wrong direction, toward the land, and the Greeks could not get to Troy. They asked their priest, Chalcas, if he knew what was wrong. Chalcas told Agamemnon that the goddess Artemis was sending the bad wind. She was angry. To put Artemis in a better mood, and get the good wind so the Greeks could sail to Troy and get Helen back, Agamemnon would have to sacrifice his oldest daughter, Iphigeneia (if-a-jen-I-ah). Naturally Agamemnon was horrified. Kill his daughter? He told Menelaus he couldn’t do it. But Menelaus said then he would be breaking his oath to save Helen. In the end Agamemnon agreed to kill Iphigeneia. He got her mother (his wife), Clytemnestra, to bring Iphigeneia to Aulis by telling Clytemnestra (kly-tem-NES-tra) that Iphigeneia was going to marry the famous young hero Achilles. But when Iphigeneia got there, he tied her up, put her on an altar, and killed her. Then Artemis was happy, the wind changed, and the Greek ships sailed for Troy. The Pride of Lions: The Story of the House of Atreus, by Norma Johnston (2002, unfortunately out of print right now, but maybe your library can find it). For teens. 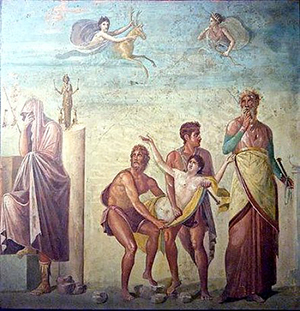 Iphigeneia at Aulis, by Euripides. Translated by W.S. Merwin and George Dimock. The original Greek play, translated into English. Iphigeneia: Agamemnon’s Daughter : A Study of Ancient Conceptions in Greek Myth and Literature Associated With the Atrides, by Maria Holmberg Lubeck (1993). By a specialist, for specialists. Cite this page: Carr, K.E. Iphigeneia in Aulis – Euripides – ancient Greece. Quatr.us Study Guides, July 15, 2017. Web. April 21, 2019.